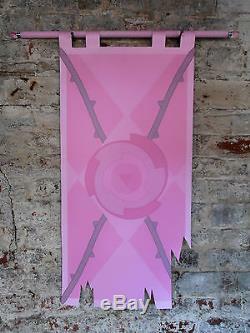 A'lifesize' handmade banner inspired by the cartoon Steven Universe, and the character Rose Quartz, whose. Digitally printed on durable vinyl, these banners have a smooth, matt surface (silver or white on the reverse) and are designed to be hung from a rod by the tabs along the top. Velcro on the backs of the tabs allows easy repositioning and rolling for storage. 1 lifesize printed vinyl banner. 1 hanging rod crystal rose end-caps (resin). 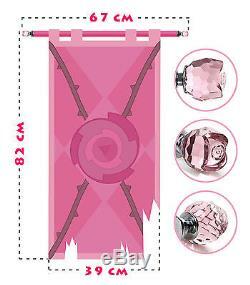 DIMENSIONS & DISPLAY Each banner is aprox 90 x 40cm when hung, (99cm tall un-hung, including tabs). The wooden hanging rod supplied is aprox 2.5cm thick; the banner is best displayed hung from X2 hooks screwed into the wall (not supplied), though you could also remove the tabs with scissors and attach a slide-on plastic poster hanger to the top, hanging the ribbons from the ends. UPDATE - RIBBON AND TASSEL COLOUR Some ribbons and tassel colours are now in very limited supply or discontinued altogether. To avoid disappointment, a random tassel colour will be selected per banner in a shade which compliments the design. Ribbons may also vary from the samples shown, but will also be selected to match the banner colours. The above image shows an example of the tassels currently available, with shades of gold being the most common. If your heart's set on a particular colour, drop me a message and I'll do my best to match it; though it may take a little while to order special colours in, and availability is not guaranteed. 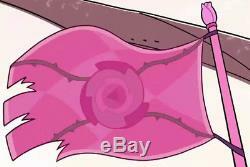 The item "Rose Quartz battle flag, lifesize banner, Steven Universe, Crystal Gems" is in sale since Wednesday, January 18, 2017. 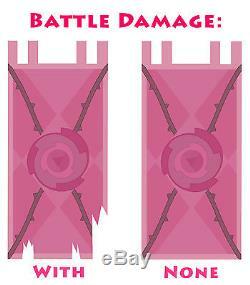 This item is in the category "Toys & Games\Wargames & Role-Playing\Warhammer\Warhammer 40K\40K Miniatures". The seller is "leagas123" and is located in Sudbury. This item can be shipped worldwide.